NASA's space shuttle Discovery launches into space just before dawn on April 5, 2010 to begin the STS-131 mission to the International Space Station. Thisstory was updated at 9:23 a.m. ET. CAPECANAVERAL, Fla. ? 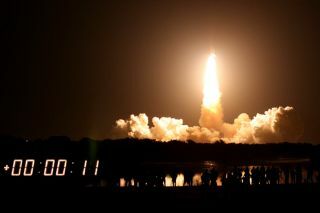 The space shuttle Discovery lit up the sky above Florida likean artificial sun Monday in a rare pre-dawn liftoff of one of NASA?s lastfew shuttle missions ? and the final flight expected to launch under cover ofdarkness. Discoverysoared spaceward from a seaside launch pad here at NASA?s Kennedy Space Centerwith a crew of seven astronauts on a busy delivery mission to the InternationalSpace Station. Liftoff occurred at 6:21 a.m. EDT (1021 GMT). ?Itis time for you to rise into orbit. Good luck and Godspeed,? NASA test directorPete Nickolenko told the astronauts. ?We?llsee you in a few weeks,? shuttle commander Alan Poindexter radioed back. ?Let?sdo it!? Discoveryis hauling about 17,000 pounds (7,711 kg) of new science equipment, suppliesand spare parts to the nearly complete space station. ?It?sa complex 13-day mission,? Poindexter said before launch. ?Our main mission isresupply.? Onlythree more shuttleflightsremain after this one before NASA retires its aging three-orbiter fleet in lateSeptember. After that, the space agency plans to rely on Russian Soyuzspacecraft to ferry astronauts to the station (along with unmanned Russian,European and Japanese freighters to haul supplies) until American-builtcommercial vehicles become available. ?Well,it?s disappointing. The shuttle has been an incredible machine,? Discoveryastronaut Clayton Anderson said in a NASA interview. ?It?s done so many thingsfor the space program that its legacy is well understood by most. But I amprivileged to be able to say that I?ve flown both on the shuttle and on thestation.? Anderson,who is making his second trip to space, said he wished the shuttle fleet couldkeep flying, but understood it was time to be retired. WhileDiscovery is in orbit, NASA will celebrate the 29th anniversary of the firstspace shuttle flight on April 12, which is also the anniversary of the firsthuman spaceflight by cosmonaut Yuri Gagarin in 1961. Three days later,President Barack Obama is expected to hold a summit here in Florida to discusshis new space plan, which calls for retiring the shuttle fleet and cancelingits successor Constellation program to make way for commercial spacecraft. Monday?smorning launch was expected to be visible to skywatchers all along the easterncoast of the United States, weather permitting. Althoughit is the second shuttle flight this year to launch before sunrise (shuttle Endeavourmade a similar liftoff in February), such pre-dawn blastoffs are relativelyrare for NASA. Of the 131 shuttle missions launched since 1981, only 35 havelifted off in darkness, NASA officials have said. RidingDiscovery into orbit with Poindexter and Anderson are shuttle pilot Jim Duttonand mission specialists Dorothy ?Dottie? Metcalf-Lindenburger, RickMastracchio, Stephanie Wilson, Clayton Anderson and Naoko Yamazaki, whorepresents the Japan Aerospace Exploration Agency. Dutton,Metcalf-Lindenburger and Yamazaki are making their first spaceflights. Themission may be busy, but it also includes some firsts. Discovery?slaunch marked the first time four women have flown in orbit at the same time.The fourth female astronaut is already aboard the space station after arrivingat the outpost on Sunday. Yamazakialso joins fellow Japanese astronaut Soichi Noguchi, who is on the spacestation, in orbit ? the first time two Japanese spaceflyers have been in spaceat the same time. Throngs of Japanese reporters and dignitaries were on hand tochronicle her launch. Beforeboarding Discovery, Yamazaki held up a sign with messages in English andJapanese. ?Many Thanks. Go STS-131!? it read. Metcalf-Lindenburgerwore a broad smile as she climbed aboard, holding up a sign for her family, oneside of which had a hand-drawn rocketship and practice countdown for her3-year-old daughter Cambria. WhenDiscovery arrives at the space station, it will boost the outpost?s six-personpopulation up to 13 people in all for a short while. The shuttle launchedjust one day after a Russian Soyuz spacecraftdocked at the stationon Easter Sunday to ferry three new crewmembers, including NASA astronaut TracyCaldwell Dyson, to the orbiting laboratory. Discovery?sSTS-131 mission, like most of NASA?s last shuttle missions, is aimed atstocking the space station with gear and spare parts it will need to sustain afull six-person crew once the shuttle fleet is retired. Ahuge cargo module the size of a small bus is packed away in Discovery?s payloadbay. It is filled with refrigerator-sized racks of supplies and scientificequipment, though larger spare parts meant for the space station?s exteriorhull are stored on a pallet in the shuttle payload bay. Threespacewalks are planned for Discovery?s crew to install a huge gyroscope and aspare ammonia tank for the station?s cooling system. The station parts are solarge that only NASA?s space shuttles are capable of delivering them to thespace station. Monday?slaunch marked the start of the 38th spaceflight for Discovery, NASA?s oldestspace shuttle. It is the 33rd mission dedicated to completing construction ofthe nearly 12-year-old space station. Onlya few minor hiccups popped up during the countdown and launch. A fuel cellglitch delayed fueling of Discovery slightly and a malfunction in a safetysystem designed to help destroy the shuttle if it strays off-course occurred shortlybefore liftoff. But a backup system worked fine, NASA officials said. Withthe shuttle in space, Discovery?s crew will gear up for their first big chore:Scanning their heat shield for damage using a 50-foot (15-meter) inspectionpole at the end of the shuttle?s robotic arm. So far, no major concerns havearisen, mission managers said. Thatinspection is slated to begin in the wee hours of Tuesday morning and lastseveral hours. Poindexter and his crew are working an overnight shift for theduration of their spaceflight. Discoveryis due to dock at the space station on Wednesday at 3:44 a.m. EDT (0744 GMT).Landing is scheduled for Sunday, April 18. SPACE.comis providing complete coverage of Discovery's STS-131 mission to theInternational Space Station with Managing Editor Tariq Malik in Cape Canaveral,Fla., and Staff Writer Clara Moskowitz based in New York. Click here for shuttle missionupdates and a link to NASA TV.